(Newser) – Donald Trump has chosen a health secretary who knows the system inside out and has been trying to get rid of ObamaCare since before it became law, sources tell Politico, the AP, the Washington Post, and other outlets. Rep. Tom Price, a 62-year-old orthopedic surgeon first elected to the House in 2004, is chair of the House Budget Committee and has worked closely with Paul Ryan on deficit-reduction budgets. 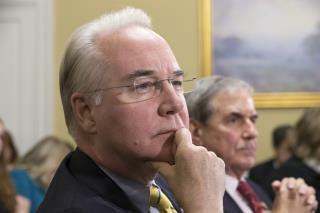 Price supports major changes to Medicaid and Medicare as well as ObamaCare, reports the Post, which notes that he is very familiar with the "budgetary process, the federal bureaucracy, and the costs and mechanics" of changing the programs. He has no sane plan on health ...or anything else. Pre existing conditions can be covered but must be done so at a higher rate. The whole concept of insurance is the idea of EQUAL risk sharing amongst all of the participants. If any one person has a higher propensity for a claim because of a pre existing condition or as in auto insurance (many accidents), those folks can be covered but at a proportionately higher rate. Otherwise, the others in the plan will be, in effect, subsidizing insurance for those people and that is eminently contrary to the concept of equal risk sharing. In life and auto insurance, insurers have the right to deny coverage entirely, or issue a policy with a rating (higher rates based on severity of condition), or issue a regular policy with an exclusion for the anomaly. And medical insurance should be handled in same manner - it is the only Fair and correct way to do so. The notion of covering all preexisting conditions needs to be modified to only preexisting conditions that are not self inflicted. Why should legitimate contributors to a health care insurance plan pay for abortions, cancers, heart disease, emphysema, liver and heart transplants related to tobacco and alcohol abuse, criminal activity, sickness due to sexually transmitted diseases like aids. Allowing people that abuse themselves and get sick to buy insurance after the fact defeats the idea of insurance. You can't get car insurance after you have wrecked your car. It is either insurance or socialized medicine. But if you want to keep the costs down, you have to set certain limits. If you don't care about costs, or timely service then the ACA should be kept in place; with the only change needed is to force everyone onto the rolls; monitoring everyone as to their income and ability to pay the complete cost of insurance.